At Green Oak we take pride in providing professional grade products that are made with only the highest grade ingredients. This streak-free screen cleaner gently cleans all electronic screens such as TVs, tablets, and smartphones. The formula does not contain any alcohol or ammonia and is safe for the entire family to use. NOTE: Please turn off and unplug electronics before use. Never spray directly onto the screen. For best results and to avoid scratches, wipe lenses only with microfiber or other scratch-free cloths. Avoid contact with eyes. In case of contact, flush with plenty of water. LOOK NO FURTHER! 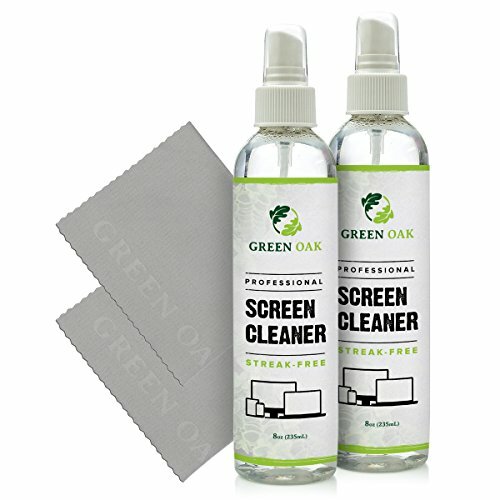 This professional screen cleaner spray combines all of the features and benefits you seek to effortlessly and safely clean your computer monitor, iPad, iPhone, MacBook, TVs and so much more! EASY TO USE: This amazing screen cleaner comes in convenient 8oz spray bottles (2x) for easy application that clean over 1000 screens (per bottle)! NON-TOXIC: Family-friendly screen cleaner formula is safe, 100% biodegradable, odorless, eco-friendly, and gentle on skin. STREAK-FREE GUARANTEE: This quick-acting screen cleaner spray does not only ensure clarity, it also helps in protecting your screen from dust and scratches!